Why hello there, dear readers! I'm sorry to say that since my last post was on Friday (oops), not much has happened since then. Mostly I've been getting over my post SPX cold and playing tour guide to the fantabulous Ms. Colleen Frakes. Oh and teaching my classes of course! So in the world of Beth, I still haven't made any new comics (boo) BUT I've begun working on the third part of Fugue that will be completed in February and debut at whatever con is close to then... Stumptown? MoCCA? TCAF? Zine Fest? CAKE? All of these are beeeeaaauuuutiful options! Also there is a top secret project that will be beginning in November... Hrm what else happens in November that this may be related...more details to follow on THAT! Your senior year at CCS you get to share a big studio room with your classmates. It was probably one of the best places I've ever worked. Not just for the people because they're fun, but it really gave me a place to 'clock in' and not work on or think about anything else but my comics. And since it was shared, there was almost always someone there working while you were. At times this could be bothersome, but more often than not it was encouraging, helpful and something to look forward to. There was always a sounding board around when you needed one. At the same time, the moments when you had the studio all to yourself were equally treasured. My favorite time was early mornings on Saturdays and Sundays, sometimes Andy Christensen was there, but other times no one until 10am or 11am. To my immediate left was Josh Kramer, and to my immediate right was Nomi Kane. Blurry detail of some things on my desk. 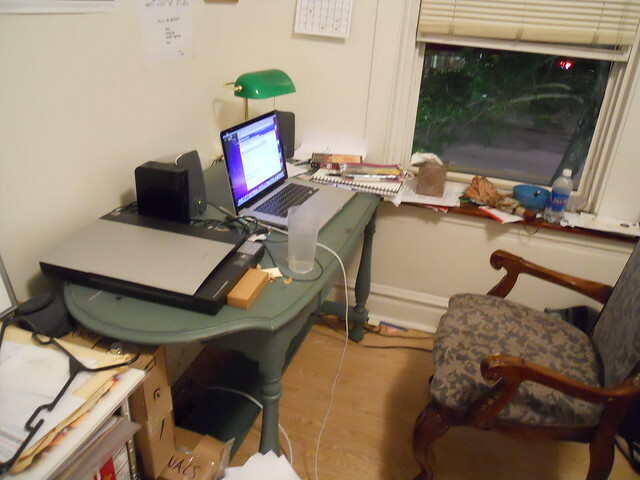 I am now in Chicago, as you know, and again I am blessed in having two desks! I realized that sitting on the internet and doing digital work for me needed to be seperated from wherever it was I was drawing. 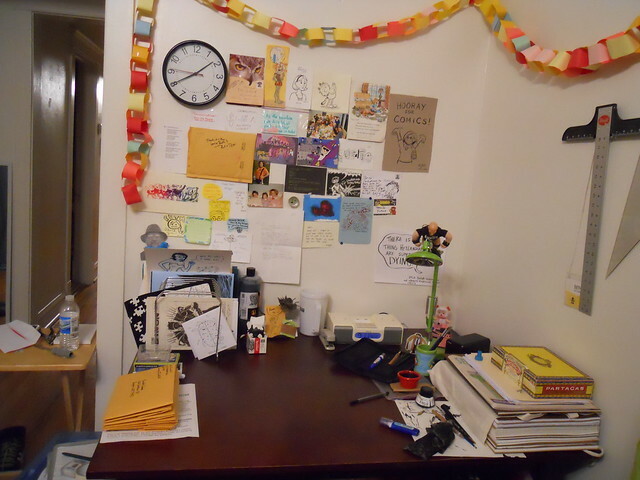 It would slowly creep into that creative space and take over. 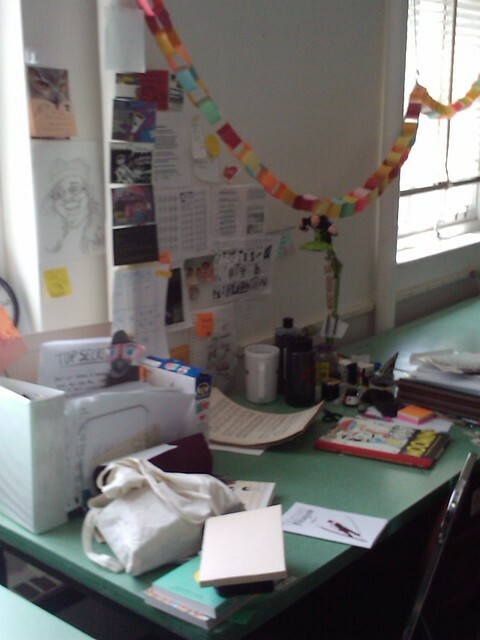 And with teaching, I needed a space to be assembling lesson plans, lectures, handouts and more that WASN'T my drawing table. Pictured above is my 'work table' that I do any digital stuff, internet stuff, school stuff and watching netflix sometimes stuff. 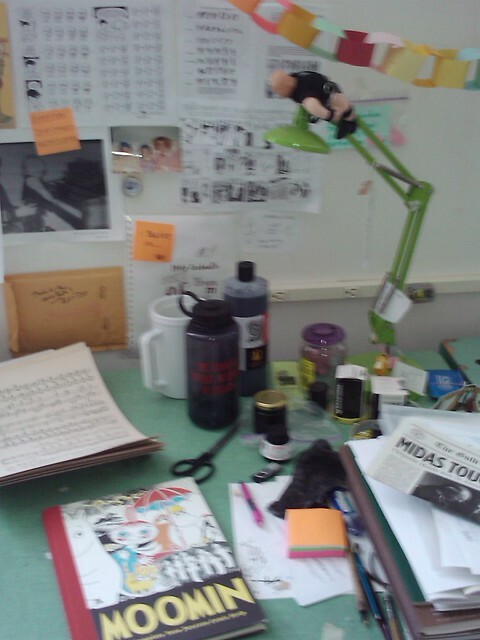 This is usually in a very messy state as I juggle several things a day here. A very blurry 'beneath' the table shot. 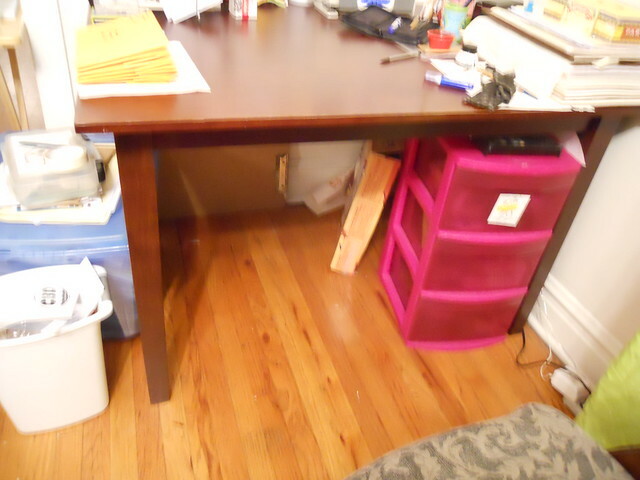 Where my light box, plastic supplies drawers and legs go. Just the desk surface. That big pile of bristol to the right? That's Fugue! I love this! Thanks for posting pics Beth! I totally agree about separating your comprooter stuffs from your drawing stuffs. It's so necessary. 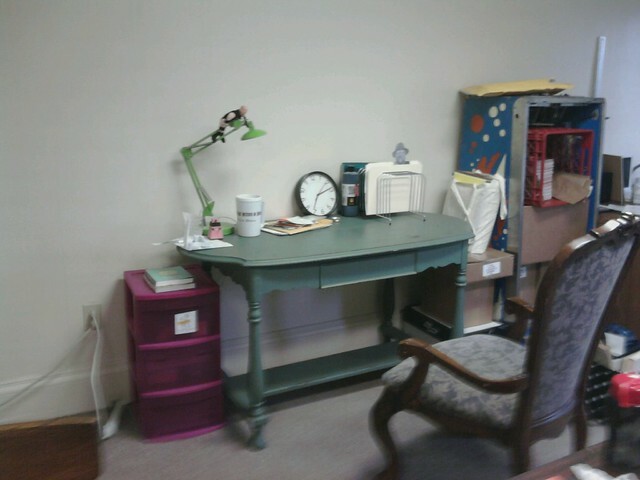 I have all my digital crapola in a whole 'nother room now. Whoa! The telegraph studio is unrecognizable in those pictures. 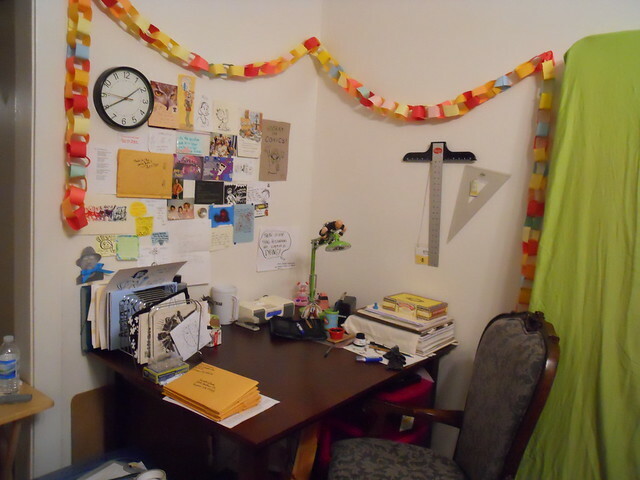 Glad I had a change to work there for a night or two when it was in its full paper-chain glory. very nice, I always like studio tours. And nice computer! @Josh, yeah right?! I miss the live action RSS feed that is Josh Kramer to my left! @Sally, no problemo man, it's all for you chilibean! @Dakota, Yeah I hope I get to see what your studio looks like sometime! Maybe you guys should create a paper chain!